Major wine growing regions of New Zealand. You’ve heard it said that “A little bit of knowledge is a dangerous thing,”…When it comes to wine, particularly, for our purposes here, wines from New Zealand, I would suggest that a little bit of knowledge is a limiting thing. Limiting one’s exploration of a region’s vines will simply result in a myopic view of the country’s wines. The only one who loses in that equation is you. In the next couple of paragraphs you will get a concise explanation of why there’s more to New Zealand than only Sauvignon Blanc. The intention is that you will be the richer – in taste, anyway – for it. Spanning 10 degrees in latitude (1600 km), New Zealand’s terroir changes dramatically from the sub-tropical north to the cool climate, mountainous south. It’s extraordinary to consider that 70% of New Zealand’s vines are ten years old or less. And while Sauvignon Blanc thrives better in New Zealand than pretty much anywhere else on the planet, the explorations and discoveries of what Pinot Noir, Syrah and Gewurztraminer can do in the land have the N.Z. winemakers hot under the collar. There’s an area on the North Island that gets long hours of sunshine and profits from a warm summer and a dry autumn. That are is called Hawke’s Bay and they are producing some of the New Zealand Syrahs that people are starting to talk about and take notice of. The winemakers of the region will tell you that it comes “purely down to site selection in Hawke’s Bay.” All the fuller-bodied wines are coming from Hawke’s Bay, a region that stretches from coastal to inland. Any conversations around Syrah and red blends from the region and you will hear about Gimblett Gravels, a sub-region that’s inland, as well as Bridge Pa which is home to Paritua Vineyards, “One of the most beautiful vineyards you could ever visit,” said Michelle and Michaela of House Wines. Paritua Vineyards, in New Zealand’s acclaimed wine growing region, Hawkes Bay. “We are different from the Gimblett Gravel Vineyards,”explained the Paritua Vineyards managing director and co-owner, Gary Fisher. “They’re only about 5.6 km away. That whole region is an old alluvial River Bed. Where we are, the soils are a lot older; silt loams hold the water nicely. We use less irrigation, the roots of the vines go a bit deeper. We don’t throw new French oak at our wines.” Their Hawke’s Bay ‘Red’ ’07 is a soft, rich, voluptuous blend. Elephant Bay’s “Rhone-like” style Syrah, rich berry, plummy and black peppery with a hint of violets, is showing an elegant, more restrained style of Syrah from the region. 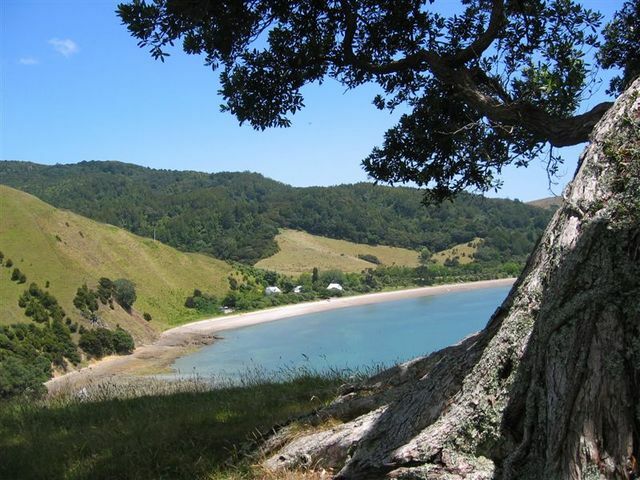 Gunter Thies of Elephant Hill Estate Winery explained that Te Awanga, where their winery is situated, is a coastal region so the fruit gets the hot days and but is cooled by the ocean breezes in the afternoon. Staete Landt, in Marlborough, on the South Island has also planted a few rows of Syrah. It’s an unusual grape for the region, which is known mostly for its Sauvignon Blanc and now its Pinot Noirs. Dorien of Staete Landt explained, “It’s a wine we like drinking ourselves.” She and her husband-partner Ruud, planted six rows of the vines. It’s their second vintage only, the Staete Landt ’08 Syrah. They planted in riverbed soils which yielded a full, smooth Rhone-style Syrah. They produced only 100 cases for the world. Man O’ War Bay. Waiheke Island, New Zealand. Man O’ War Ironclad on Waiheke Island is also growing Syrah. This region is just off the coast of Auckland; you take a ferry to get to it. They have 90 vineyard sites on their property where they also harvest honey, maintain olive groves and sheep flocks. They’ve made a “Bordeaux Blend,” which is mostly cabernet sauvignon and cabernet franc.